You are currently browsing the archives for the tag 'black nail polishes'. 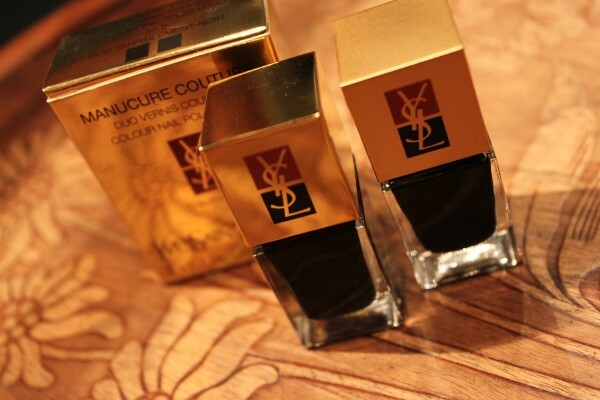 A few weeks ago, I introduced the new YSL Holiday 2011 makeup look to you. Yesterday, I finally found the time to test the nail polish duo “N°6 Duo Terriblement Noir”. I am so happy with the result and hope that you will like it, too. The two blacks, one matte and one glossy, have a wonderful texture and look great worn alone. But I couldn’t resist reproducing the French manicure look from YSL’s ad campaign using the matte polish as the base and the glossy one for the tips. The only bummer is that you have to be really careful when using hand cream or cuticle oil as this will damage the matte effect easily.